A couple of weeks ago I got my copy of the Congolese Keepsake Cookbook written by my sweet friend Heidi Deschryver Ramsey. She is selling them as a fundraiser on her Creations for Congo page on Facebook. The Ramsey Family are raising funds for another adoption. About the same time we brought home Manny and JoJo, they brought home two sweet babies, a boy and girl. Their son is just the spitting image of Manny, so he holds a special spot in my heart! Heidi's cookbook is so wonderful and unique. First of all, if you go to say, Amazon, and search for a Congolese cookbook, you will find none! So it is definitely filling a niche. 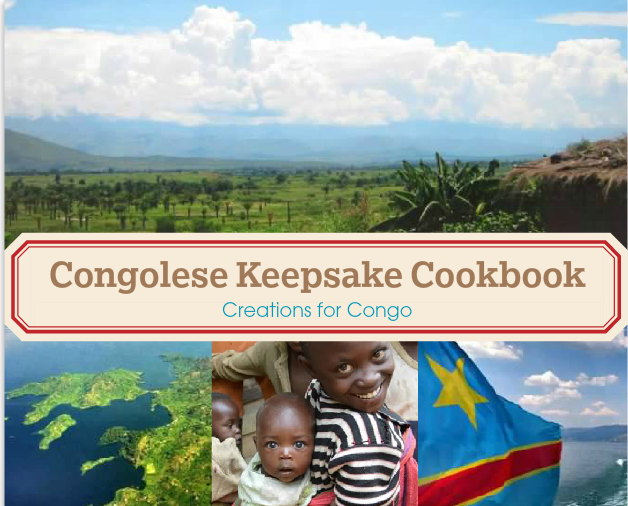 It is filled with gorgeous photos of Congo and, of course, lots of authentic Congolese recipes. Heidi was a missionary kid whose parents served in Congo and then she continued to live there into her twenties, fully immersing herself in the culture. So Heidi didn't just Google Congolese Food and copy and paste them into a pretty book. She really knows her stuff! I must admit, I was not super impressed with Congolese food I tried on my trips to DRC (no offense to the cooks at the guest house). So I wasn't really sure if I would LOVE the dishes in this book. But good news--I did! We tried two dishes: Meat Moambe and Pili Pili. Meat Moambe is sort Congolese beef stew and Pili Pili is a very spicy condiment that is on every table in Congo. I never tried the Pili Pili while we were in Congo because I was a little afraid it would aggravate my already sensitive travelers gut. But Brian said it turned out to taste remarkably authentic. The Moambe can be made with almost any kind of meat, but we used beef stew cubes. It can also be made with palm soup base or peanut butter and we used the peanut butter. We served it with white rice. I loved it. The kids ALL loved it (even Grace, the pickiest eater on the planet). I had it again for lunch the next day at work, so it reheats beautifully. Just so you know, I did not prepare the food. Brian is the cook. Always and forever, 'til death do us part. He is a fabulous cook. I would have managed to screw up this recipe and would still not like Congolese food. So anyway, buy the book. It's worth the price, it would make a great gift or keepsake, and it is for a wonderful cause and a wonderful family!